Happy Monday to you all! 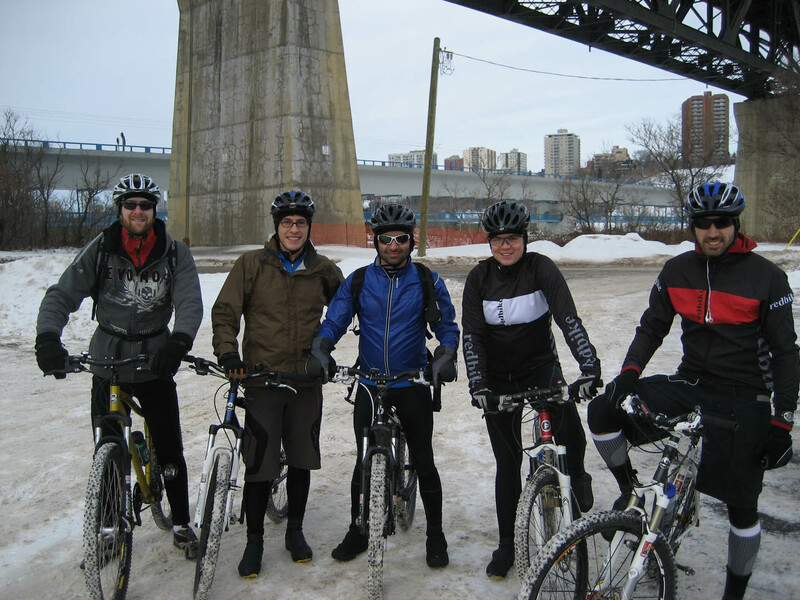 Winter in Edmonton (Alberta Canada) for me is mostly a long, dark and cold expanse of time devoid of any real biking. Winter means it’s time to get out the trainer and start to think about which new movies and which TV series I want to get caught up on; last winter it was Rome, and Seinfeld. Ken on the other hand, has been consistently riding all winter long for a few seasons now, and of course, he’s been givin’ me the gears for cowering inside as much as I do. This year though, I’ve managed to get out there ‘a bit’ more, and let me tell ya, once you get movin’ and warmed up, it’s pretty sweet and in some ways more fun than summer riding. I guess this winter we’ve been pretty lucky here in Edmonton. It’s been mild, at least by our standards. Here it is mid January and today it was a balmy -2 degrees. For those of you not from this area, it’s normally more like -22 degrees Celsius this time of year, so we’re getting off pretty easy right now. The cold aside though, I’ve also always been hesitant to get on the bike during the winters too much because of the ice factor. Clearly riding on snow and ice is a lot different than riding on dirt and gravel. You have to change your whole riding style, from climbing, to descending, to cornering – it’s a different ball game. It takes a lot more ‘finesse’, if I needed to give it a word. Once you adapt your riding style though, really, there is no more risk of falling/crashing in the winter than there is in the summer. And, as a general rule, your speed is slower and the ground is ‘softer’ due to the snow itself. 1) It should go without saying, but invest in some good, warm gear. By this I don’t mean a big parka; I mean get some quality thermal layers and a shell to keep wind off you and to keep you dry. For some solid product reviews you can link to one of Ken’s articles here. For me, keeping my hands and feet warm is key. Once you get moving, your core stays pretty warm on its own. 3) Tire pressure – essentially, drop it nice and low. Today I was running 22 lbs up front and about 24lbs at the rear, and I could have dropped it a bit more. This helps with grip. 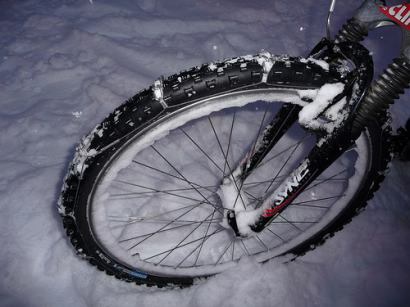 I know there are other options like studded tires, and even chains for your bike tires, but I don’t know how necessary that really is. Ken might be able to speak more to that. I think he runs some swanky carbide tips on his winter bike. 4) If you are up for some single-track, get ready for a serious core workout. Most of the single-track out there right now only gives you a narrow track of packed snow to roll along. The second your front tire slips off, you’re into the deep fluffy stuff and you sink right in – it’s kind of like rolling into deep cotton. Balancing on that beam of packed snow puts your stabilizer muscles and bike handling skills to the test. It’s good fun. 5) Lastly, eat. Eat about 2 hours before you go out, but eat well, and don’t be shy with the protein. Food in your belly, especially protein, will help to keep you nice and warm. When it comes to winter riding, you just have to look on the bright side. It’s cold, so you don’t overheat. There are no BUGS! The valley is seriously beautiful in the winter, so get out and enjoy it. And, if nothing else, it beats sitting on the trainer for hours on end, even if it is while you’re catching up on the next season of Heroes/Lost/Six Feet Under (and of course, ‘Wild Roses’ for Ken). For anyone looking to try it, there are a couple weekend rides that I know of, and one that goes out religiously is the Interclub ride, leaving from DaCapo on 109th street at 12:00pm. I think we’ll be headed out next week again as well, though likely around 1pm. Shoot me an email if you want to join in. You’re more than welcome. Wild Roses?! I had to look it up just to know what that was! Glad to hear the crew is getting out… It’s tough not to get the itch when the weather is so nice! I’ve found running regular rubber with an aggressive tread works best for soft-pack or groomed trails, but if there’s any of the ‘crunchy’ stuff, or if your tire is actually contacting the frozen ground studs will definitely help out. @ Jooles and Steve K, it’s funny. I saw some ERTC guys at Riverside with their xc skis and thought that be awesome. I’ve been meaning to get out and do that for a few winters now. You might have convinced me! I’m having a great time cross training with x/c skis (classic only) in this warmer weather. Blackfoot and Goldbar! The snow is fast and my extremities don’t freeze! I’ll HTFU and show up once for a ride this winter… eventually ;).